For simplicity sake we will describe the island of Eleuthera by breaking it up into five districts North, North Central, Central, South Central and South Eleuthera. North Eleuthera is described from the Glass Window Bridge north and is home to a handful of the island's smaller settlements. Jeans Bay is the northernmost settlement, located at the very northwestern tip of the island. It is not technically a settlement but it is where the ferry dock to Spanish Wells is located. There is also a liquor store and a few homes in the area. If you get lost on the way to Ben Bay, Tay Bay or Preachers Cave, as many do, Jeans Bay is the best place to stop and ask for directions. To get to Jeans Bay head north at the North Eleuthera Texaco station (turn right if you are coming from the North Eleuthera Airport or veer left if you are coming from the south through Lower Bogue). Follow the road for just about 6 miles, till you reach a T intersection. Take a left at the T and follow the main road (keeping left), you should arrive at the ferry dock in about 3/4 of a mile. The Bluff is the northernmost established settlement on Eleuthera and the largest in the North Eleuthera area. It is home to the North Eleuthera Shopping Center, one of the best supplied and largest grocery stores on Eleuthera. The North Eleuthera Shopping Center is approximately 3.5 miles from the North Eleuthera Airport and they have the best meat selection on the island so it is a great place to stop and grab supplies before heading to your rental. To get there leave the North Eleuthera Airport heading west, turn right at the Texaco Station, then go 1.25 miles and take a left, the grocery store is less than a mile from the turn and the Bluff settlement is another mile past the grocery store. If you take a left at the Texaco station after the North Eleuthera Airport and head south from you will quickly arrive in Lower Bogue. Lower Bogue has a variety of little shops including a fruit stand, small grocery store, ice cream parlor and a restaurant. Take a left at the ice cream parlor and you will pass the grocery store and restaurant as you head through town. Mostly likely you will just be passing through on your way to toward Central Eleuthera, but if you are staying in the North Eleuthera area this will be your last opportunity to grab some groceries or bottled water. If you wish to bypass Lower Bogue on your way south you can take a left on Skyline Dr, which is exactly one mile past the Texaco Station. At the next intersection take another left onto the Queens Highway and keep on going straight, you will pass through Upper Bogue and then reach the Glass Window Bridge in about 10 minutes. If you take the road off to the left (north) just before the Glass Window bridge it will take you toward Bottom Harbour and Whale Point, where you will find a bar/restaurant and a few vacation homes. 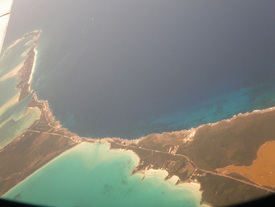 Current is the westernmost settlement in North Eleuthera, to get there keep going south from the North Eleuthera Airport, past Lower Bogue and follow the road as it curves to the east (right). In about 10 minutes you will arrive in Current and reach the end of the island at the Current Cut. Current is tiny little settlement with a small grocery store, post office, library and offers a handful of vacation rental accommodations. Current is best known for the current cut, which is a 400 ft wide and 60 ft deep “cut” between Eleuthera and neighboring Current Island. The water pulls you through a channel of abundant sea life at high speed (up to 10 knots) and is said to be one of the best drift dives in the world. The current is extremely strong and changes rapidly, so this dive is extremely dangerous and should not be attempted by inexperienced divers and without boat support and a local guide. Use the drop down menu on the upper left to locate specific points. Use the + or - symbols or your mouse to navigate and zoom.